headroom. It's stupid with lows and menace! Designed to hold together and retain clarity with lower tunings. washy, it holds together pretty nicely when cranked. It holds up well with lower tuning because of this. increases mass, for some big thunderous chords. Full-spectrum massive attack! character control with massive boosting power! Ah, deleted my last comment about the polarity protection diode cause I misread the layout. crap, you're right. moved some stuff last minute and forgot to save it. put things back to how i had them before. quick glance looks right to me now. The diode is floating off the supply now. Are you planning on matching the schematic with the parallel protection or changing it to series protection? Wtf. Not sure why it's like that. In the schematic it connects to ground on one end and the other connects to the 100r set +9V, and I had it there before I reuploaded it. I'll take another look on my computer when I take a break and see if it's in the right place there and it just got messed up when it was uploaded or what I did. ok, put it back the way it should have, so should be good. such a simple circuit, and me making so many mistakes, it's killing me. The schematic has the diode with striped end pointing *towards* +9v. The way you have it now will allow current to flow from +9v through the diode and the jumper straight to ground, i.e. shorting thw supply. You could just flip the diode orientation (which would make it like the schematic, i.e it will wor, but it is a pretty poor polarity protection since it just shorts the supply if polarity is reversed) OR flip the diode, remove the jumper and move the red +9v wire down two rows. This gives series polarity protection which will protect both the supply and the pedal if polarity is reversed. That's a good idea nocentelli. I was looking at the polarity protection and thought it was really the best implementation. I'll make the change when I get home. fixed the power protection, and the tone section including changing the 330nF cap to 33nF as mentioned in the FSB forum post. Yeah I've been wanting this one since I built the Algal Bloom. These are great sounding Fuzz units to my ear. The 470n in the power supply is also 47n on the trace, and apparently mislabeled 470n on the schematic. Not that I really expect it to make a difference! Didn't see that change in the last update. I'll fix it later, but agree that shouldn't make a difference. 2 clips. First in standard tuning, getting the glitchy radio sounds, second with a downtuned guitar, getting some heavy doom. The original pedal owner tells me they sound accurate. Yes I built two of these. This one, and my own layout. They sound the same. The bass control cuts clockwise, as in the original unit. I changed one thing on this layout though, to match the original trace. Connect Bias 1&2 on the bottom row, instead of 2&3 on row "J". 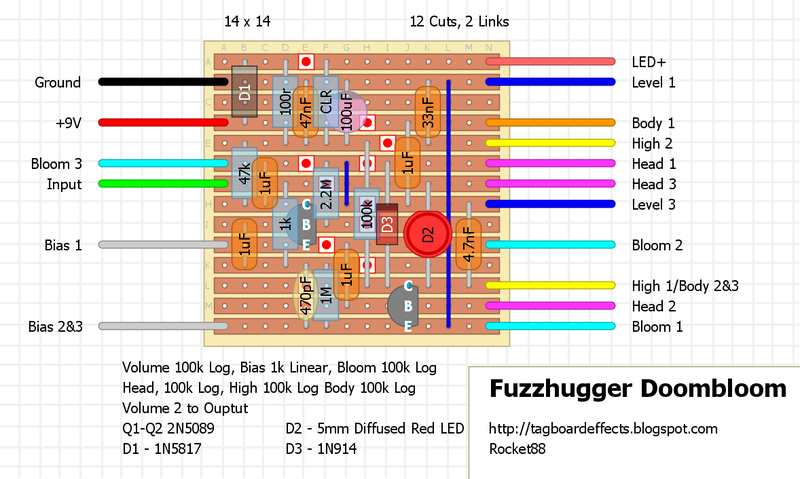 this fuzz is awesome, thanks for the layout, I'm going to build this. and is it 12cuts 2links or there is 1 more link I miss? you're right. i made a change and moved stuff around and forgot to remove the 3rd link from the layout. Oh boy, this is gonna be my Christmas break project for sure. Zach, add a DPDT wiring for this curcuit please. And where to solder the LED+ wire? I'm novice, just trying to understand. Hey man. Typically you're not going to use a dpdt switch for wiring if you want to use an led, you want s 3pdt switch. To see how to wire it up using s 3pdt switch look at the tab on the top labeled offboard. Wow, thanks a lot, everything is clear now! :) 3PDT switch is exactly the thing I need. My mistake :) This fuzz is outstanding, can't wait for building it! Thank you, Zach! anytime man. glad to help. don't forget if you run into issues with your build, have questions about building, or just want to chat check out the forum. oh, and welcome to the community man. Zach, could you help me please again? :) Messing with polarity on a LED. Can I replace it with something (maybe a diode) to get the LED out of the board to make a offboard true bypass like by the link you mentioned? Or could I wire it somehow else? Hey man. If you want the LED not connected to the board just wire it as you would any other pedal, like what's shown on the offboard wiring layout. So run a wire with your resistor value of choice from the power jack, and connect it to the + side of the LED, and connect the - side of the LED to the switch like normal. Then just remove the CLR from the layout. One thing - if I remove the LED from the layout the "Head 3" wire will not be connected to anything. Is it right? i think i miss understood what you were asking, and we're talking about 2 different LEDs. if you're talking about the LED that's shown on the board, D2, you don't want to remove that from the board as it's clipping diode not a status LED. the connection for the status LED has the + leg connected to row A on the right side of the board. if you're talking about removing the status LED connection to the board then follow what i posted before. any time bro. happy to help. Has Alex s verified this or not? Hey what is the clr resistor meant to be? The clr is the resistor for your indication LED and is whatever you like to use. finish the broad, not wiring and test yet..
will make a demo video when done, thanks for the layout. simply connect the level 1 to ground to fix..
dost the 1uf Caps need to be non-polarised? If not which way dost they face? Pakkee Hung: Did you get it to work? yes, there's a simple demo video link in comment. Verified once again!! connect Bias 2&3 on the last row and Bias 1 at row "j"!!! Never saw that it was verified. I'll mark it and make the change. Cheers man. Zach, when i connected the bias pot as it is stated in your layout i got less fuzzy sound instead. Is that possible, or my ears have gone bad from excessive testing?? haha! Cheers! he man. that makes sense to me. the pot alters the bias of Q1, so in one direction it should smooth it out, counterclockwise in the video, and the other should make it gated and gnarly, clockwise in the video. with the switching the position of the bias wires is that what it does? how will i wire it if i use a polarized 1uf caps? can't seem to find a 1uf (105).. thanks! My son wanted this pedal so we built it together, works great and he loves it! 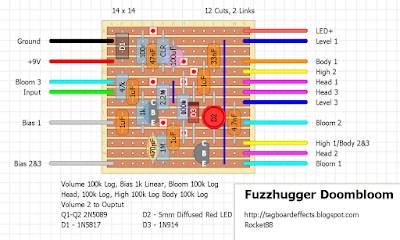 Cool Fuzz, built it into a 1590B and it fired up on the first try. It's very versatile, yet I think I'll keep my Hoof clone on my board. But I'm not entirely sure about that yet. One thing to note: I have Bias 1&2 in the bottom left to fit the shematic I found elsewhere. Not sure If that makes a sonic difference though. Thanks for another great layout! Strongly recommendet for anyone who maintains a fuzz collection.